By Ciaran D Arcy | April 10, 2012. The recent difficulties encountered by Bolton Wanderers midfielder Fabrice Muamba have been well publicised. The potential for tragedy serves as a timely reminder of the ever-present danger lurking below the surface for sports people of all ages. The images of Muamba collapsed and struggling for his life on the pitch during Bolton’s FA Cup meeting with Tottenham are now indelibly imprinted in the minds of British and Irish sports fans. Thankfully the combative central midfielder is now well on the road to recovery. For that he can thank the quick thinking and fast actions of cardiologist Dr. Andrew Deaner who was in attendance. 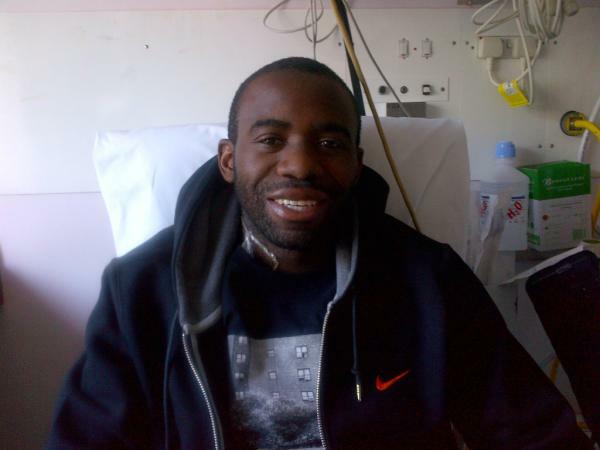 Dr. Deaner rushed to the 24-year old’s aid, performing life-saving CPR before Muamba was quickly spirited away to London’s specialist Chest Hospital to receive treatment. Muamba was one of the lucky ones. Who could ever forget the tragedy of Marc-Vivien Foé’s death under similar circumstances in 2003? The Twitter photo revealing the remarkable recovery of Fabrice Muamba. Seen on his account @fmuamba. Or those of Motherwell midfielder Phil O’Donnell and Sevilla’s Antonio Puerta, all struck down by previously unidentified heart defects in the prime of their lives. Indeed, it is estimated by CRY (Cardiac Risk in the Young) that around 10,000 Irish people carry similarly defective genes which are responsible for sudden cardiac arrest at any age. The organisation was set up in 2002 by parents of young sportspeople who had died from such undiagnosed conditions to help raise funds for the National Screening Centre located in the Adelaide and Meath Hospital in Tallaght. Due to the efforts of CRY there is now a clinic available in St. James’ Hospital which offers heart screenings to people of all ages free of charge, in order to identify any such defects that may exist and have gone undetected. In the wake of the Muamba incident, the Irish Heart Foundation issued a press release urging all sporting clubs and associations to ensure the presence of both a working defibrillator and someone who is competent in CPR wherever matches are taking place. According to the foundation, between 70 to 100 people under the age of 35 die in Ireland each year due to an undiagnosed heart condition. Brigid Sinnott, Irish Heart Foundation resuscitation expert, highlights the difference such measures can make in an emergency situation. “For every minute a person is collapsed without receiving CPR or defibrillation, their chance of survival decreases by between 7 and 10 per cent per minute,” says Brigid. The emergence of such well documented cases have prompted much needed action from major Irish sporting organisations in recent years. The League of Ireland has introduced mandatory ECG screening for players since 2007, and the Healthy Hearts Healthy Lives campaign set up by former Armagh footballers Tony and John McEntee in the wake of Tyrone Gaelic footballer Cormac McAnallen’s untimely death in 2003 visits GAA clubs around the island offering free heart screening clinics. Attitudes in relation to sudden cardiac arrest in this country have changed for the better in recent years, that much is evident. Ultimately it is athletes themselves who are responsible for their own wellbeing, and with the abundance of resources now at our disposal, there is no excuse not to avail of the free screening clinics in hospitals around the city. Photo credit: Ronnie Macdonald on Flickr.